When you’ve read the same book to your toddler a million or more times, a parody is often greeted with much hilarity. Over the past few years, we’ve seen the success of a tech-take on Goodnight Moon, giggled over That’s Not My Husband and of course who could forget the bedtime story that implored children, in language completely inappropriate for young ears, to go to sleep? 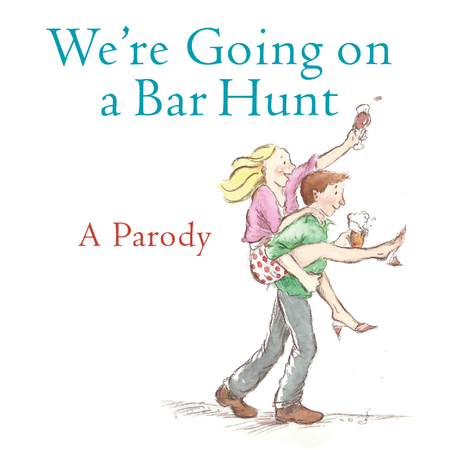 The latest to add to the collection is We’re Going on a Bar Hunt by Josie Lloyd and Emlyn Rees. It’s a parody of the much-loved classic by Michael Rosen and Helen Oxenbury, We’re Going on a Bear Hunt. Following exactly the same rhyme and illustrated in the same style, We’re Going on a Bar Hunt is a delightful adult homage to the original. However, instead of a trip through fields and woods, we see a mum and dad, making the most of a rare night out. We’re going to find a cool one. Their bar crawl takes them via an ‘offie’, a gastro-pub, a cocktail bar and a club and of course the parents find that they can’t go ‘over it’ or ‘under it’, so they best try all of these places. Woo-hoo! Jager Bombs are involved. And so is an almighty hangover. And the standard 6am wake-up call by the kids the next day. Yeah, I think I know how this story ends (with regret!). I have lost count of how many times I have read Bear Hunt to my kids – I’ll never look at it in the same way again. Find We’re Going on a Bar Hunt online at Book Depository, which delivers free to Australia. You’ll also find the original We’re Going on a Bear Hunt at Book Depository.